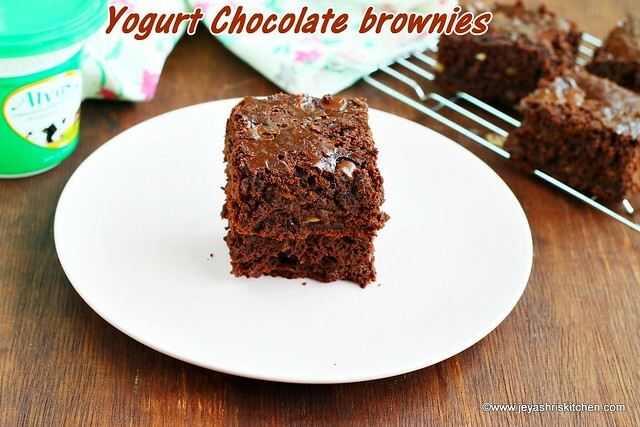 Yogurt brownies|Chocolate brownies, almost fat free brownies as no butter or oil is used in this recipe. These brownies were tasted awesome and when it is approved by kids then we can call it as a no fail yogurt brownies recipe. Now a days i am slowly reducing the consumption of store bought biscuits. I try to bake some healthy goodies at home for the kids snack box. Even sometimes if i use plain flour,at least i feel it is better than the store bought biscuits and cakes. When they wanted something chocolate based, i decided to make Chocolate brownies for them. This recipe attracted me a lot as it doesn't involve any butter or oil in this. The yogurt only gives the smooth texture to the fudge brownies. 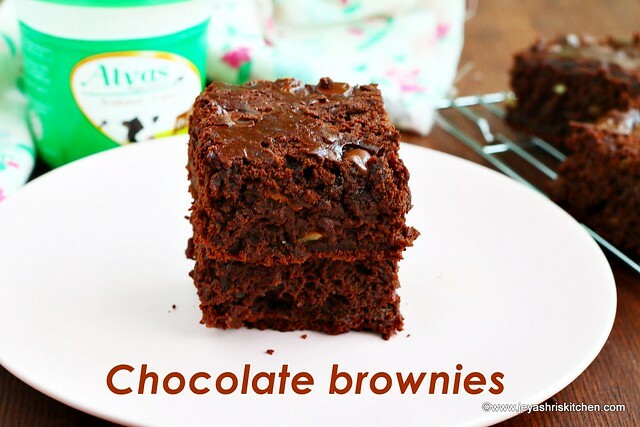 I used Alvas Natural curd to make this Yogurt brownies. -Freshly made daily in Singapore. -Sheng Siong Supermarkets and Prime super markets. 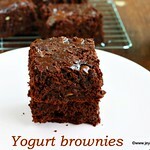 Yogurt brownies|Chocolate brownies, almost fat free brownies as no butter or oil is used in this recipe.. In a microwave safe bowl add the semi sweet chocolate chips. Melt this. It took 55 seconds for me to melt this chocolate chips completely. Time may vary from oven to oven, so start from 30 seconds and then check and proceed. If you do not have a microwave,boil water in a saucepan and place the chocolate chips in a vessel and melt it. It is popularly called as Double boiler method. Ensure the water should not touch or splutter on the choco chips. Once it is melted add the sugar to this. Mix well. You can powder the sugar and add if you want. Add the yogurt to this. I used ALVAS yogurt. Mix well till the mixture gets smooth. Sift the flour,cocoa powder and baking soda. Add the chopped nuts (if adding). Add the melted chocolate yogurt mixture. Transfer this to a lined baking tray. Sprinkle some chocolate chips on the top. This is optional. Using baking paper ensures mess free brownies. Preheat the oven for 5 mins at 160 degrees. Bake for 25-30 mins. You can check it is done by inserting a tooth pick in the center of the the brownies. If it comes out clean then it is done. Eggless yogurt brownies are ready to eat. Mix well. I used raw sugar. Add the chopped nuts (if adding). I added almonds and walnuts. Fold this gently and incorporate well. Do not cut the brownies when it is hot. Let it take 2 hours then cut it. For best results keep it in the refrigerator for an hour and then cut. Greek style yogurt works out best for this recipe,you can use home made yogurt too. If the yogurt is sour,add little extra sugar. A scoop of Vanilla ice cream tastes bests with Yogurt chocolate brownies.